The Global BIM Study will be published in early December and will provide a focus on BIM adoption in 26 international countries, with particular focus on the enablers to support national implementation programmes. This study focused on exploring the value proposition behind these initiatives and what governments and professional bodies are doing to advance BIM within their countries. You can download a sample country from this report, as well as summary document published in the September issue of the Irish Construction Magazine by clicking here. The Second Irish National Survey to benchmark the level of BIM adoption in Ireland revealed that 76% of respondents possessed confidence in their organisation’s BIM skills and knowledge. 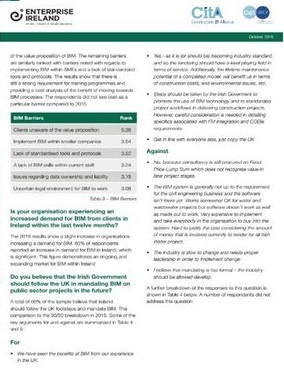 79% of the sample also reported an increase in demand for BIM in Ireland. The full report can be downloaded on the BICP website by clicking here. The Irish BIM Study builds on the established key pillars and themes required for a successful BIM roadmap formulated within the BICP Global BIM Study. This report will investigate Ireland with regards to BIM in relation to key government publications, BIM champions, existing standards and procurement routes, BIM programmes and training, establishing pathfinders projects through investigating current BIM adoption on public and private sector projects and current initiatives in place to stimulate the industry wide adoption of BIM. A brief summary of Consultations held with public sector bodies can be viewed by clicking here. A summary document on this study will be published in the December issue of the Irish Construction Magazine. As part of the BICP initiative a number of working groups were set up to investigate key sectors that will need guidance if BIM is to become an industry norm. This includes the BICP Client Working Group, BICP Academic Working Group and BICP Contracts and Procurement Group. To date, the BICP Client Group have been the most active and expect to publish a report in early 2017 with regard to the key findings for current Client ICT adoption. Their next meeting is scheduled for the 16th of December. The BICP Academic Working Group and the BICP Contracts and Procurement Group will hold their first meetings in early December. The first consultation workshop taking place on Monday 28th November will seek to provide an opportunity to feed into the National BIM Programme for Ireland by eliciting experiences, aspirations/future directions of owners, designers, constructors and building operators/managers in respect to a future requirement for the use of BIM on Irish public and private sector projects. Items under discussion will include the nature of economic and industry constraints to BIM adoption, as well as the identification of business strategies and models that may support adoption of BIM in the architecture, engineering, construction and facility management sectors in Ireland. A number of case studies focusing on best practice effecting of BIM on Irish projects in the Irish and international markets will be reported on. The National Children Hospital represents the first Irish BIM Case Study with a summary of the project available by clicking here. This case study will also feature within the 3rd edition of the BIM Handbook. 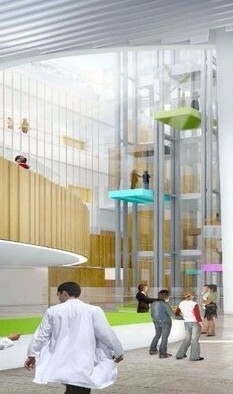 The projects presented at the CitA Irish Innovation Awards will also be summarised as part of BICP Case Study strategy. The number of BIM programmes available within the Irish Institute of technologies have been identified and mapped out here on the dedicated BICP website. HEI Consultations have taken place with Dublin Institute of Technologies, University of Dublin, Carlow Institute of Technology and Waterford Institute of Technology and Dundalk Institute of Technology. Copyright © 2016 Construction IT Alliance, All rights reserved.